Positively Pink Packages is a non-profit organization that provides vital resources to breast cancer patients free of charge. Positively Pink takes the best information, coping tools and comfort aids and puts them all in one place. This new chapter will provide breast cancer patients in DeKalb County with Positively Pink’s signature Diagnosis Care packages. These care packages contain items such as CALM Natural Lip Balm, a post surgical pillow, DVDs, inspirational and educational books, and publications that help patients understand breast cancer, the choices they face and the resources available to help them and their families. These care packages will be provided to health care personnel such as surgeons, physicians and women’s centers that are involved with the diagnosis of patients. 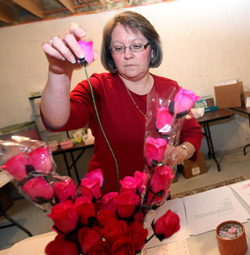 Chilson, a Sycamore resident and breast cancer survivor, is the director of the Illinois chapter for the nonprofit organization Positively Pink Packages, and she delivers an average of about 60 care packages each year to breast cancer patients. Her goal is to make sure every breast cancer patient in DeKalb County benefits from her service. "I chose CALM Skin Care Lip Balm because Cancer patients going through Chemo and/or Radiation treatments and surgeries lose moisture in their lips. Patients are told they should stay away from products that contain dyes, artificial ingredients, metallic ingredients, perfumes, etc. CALM Skin Care Lip Balm, it is completely natural and being Eco-Friendly is an added bonus."